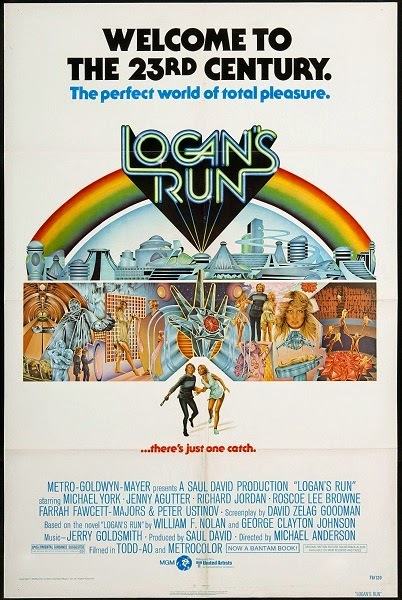 Corinne and Tim take a chance on Carousel by watching Logan's Run from 1976. Remember, never trust anyone over 30. Warning: Contains spoilers, explicit language, and fish... and plankton... and sea-greens... and protein from the sea. Want us to pose for your next ice sculpture? Prefer to expound on 23rd century trends in clothing (or the lack thereof)? Leave a comment below and keep the discussion going. The film isn't actually that loose an adaptation of the book. The climax and ending are entirely different (probably the book's weakest aspect) and Carousel was an addition (in the book, they had Soylent Green style suicide clinics). Otherwise, pretty much everything that's in the movie does come from the book, it just shuffles the order of a lot of it around. The book is... strange. Nolan and Johnson wrote it by, without discussing, tossing it back and forth from chapter to chapter, so every other chapter, you have one author who wildly tangents off in bizarre directions, followed by the other trying to wrestle those new elements back into place in some form of a coherent narrative. That's probably why Nolan wrote the rest of the books solo. That said, I still find the book to make a lot more sense than the movie, because it does go into how this world happened and how it works, with a satirical edge directly tying everything to the baby boomer youth protests of the 1960s, taking them to an ultimate extreme of having led to full on revolution. With the younger ages cutting off at 21, it also has a darker edge to the sequences of youthful hedonism and abandon. I think that's something that is overly muted in the movie. Mid/late 20s just doesn't have that same air to it. That's usually when the abandon slows down for people, so it makes sense to, in a society that's all about the party, to cut out while still at that peak before settling and reflection can kick in, especially when you don't want the populace to start asking questions. I do enjoy the movie, but it is kind of a mess. It's actually the pacing that hurts it for me more than anything else. I find it too sluggish at times. I'm all for a remake, especially given the post-Hunger Games climate. The book is also a mess (a hell of a mess at times), but I do recommend giving it a look if you're a fan. I've been trying to find a copy of the book (for a halfway affordable price) for a while. I remember a collection of three books in the series being available but of course, I hesitated. One must never hesitate from buying a book. It's a fair point about the change in the age cut-off. While everyone matures differently, it does feel like people reaching thirty might begin to reconsider their situation and think about the society they're in, and not just because they're going to get vaporized on Carousel. I think some of the deleted scenes with Francis talking to those going on Carousel may have fleshed out those ideas a bit. I know they've been in development for a while but given the YA boom of dystopia fiction I'm surprised that Warner Brothers (assuming the property is still there) hasn't put more of an effort into getting the remake out moving. Absolutely. With the success of Hunger Games, Maze Runner, even Insurgent, it's really surprising that the reboot continues to linger in development hell. Last I heard, Ryan Gosling was still attached and they wanted to keep the cutoff at 30. Heck, I'm surprised they haven't even reprinted the books to shelve alongside other YA dystopias. It's a messy book, but does fit in with recent examples I've read.